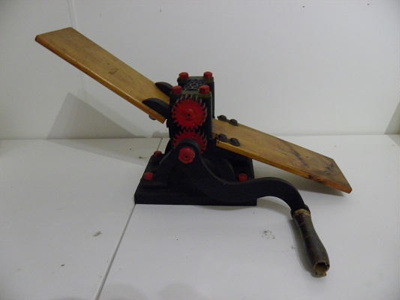 Hand cranked cast iron and brass sweet roller or lolly moulding machine with wooden handle and wooden arms. The roller functions with two cogs attached to two central roller moulds which turn when the handle is turned. The sweet roller was used to shape home-made boiled sweets and confectionery such as pear drops.